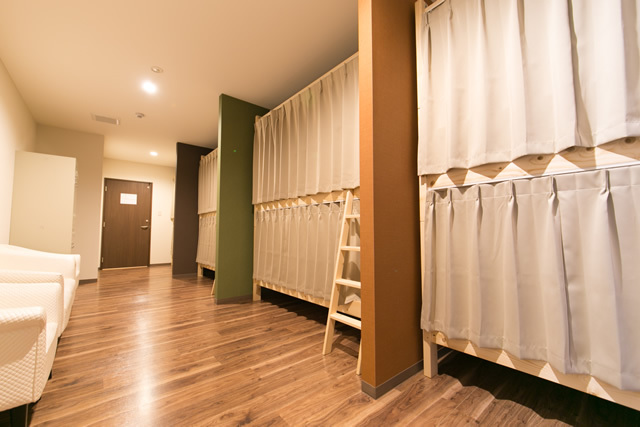 A dormitory (40 beds): There is the women-only room, too. 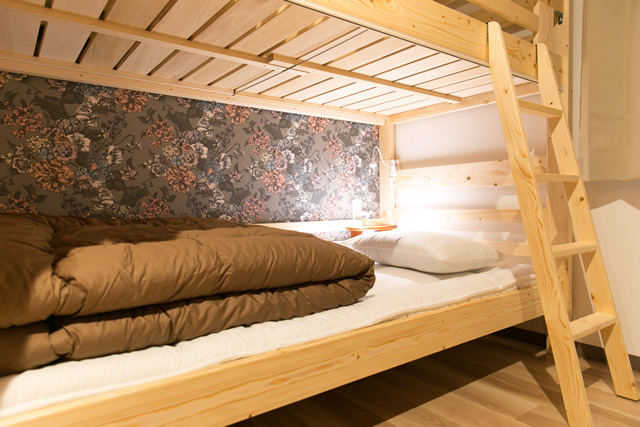 A dormitory (28 beds): Man and woman common use. 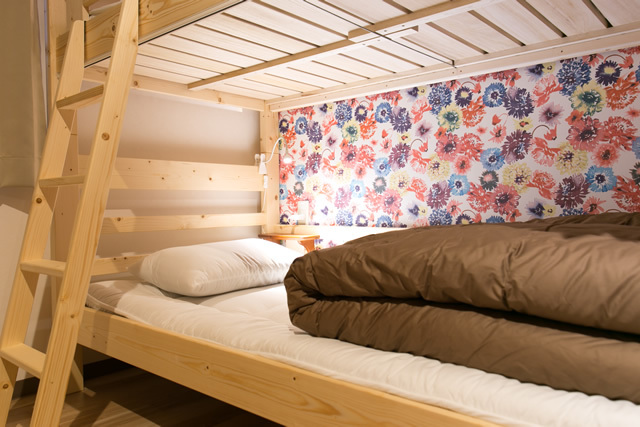 A dormitory (12 beds): Only for women. From Sunday to Friday night: 3,000 yen (tax-excluded). Saturday, a busy season night: 3,300 yen (tax-excluded). 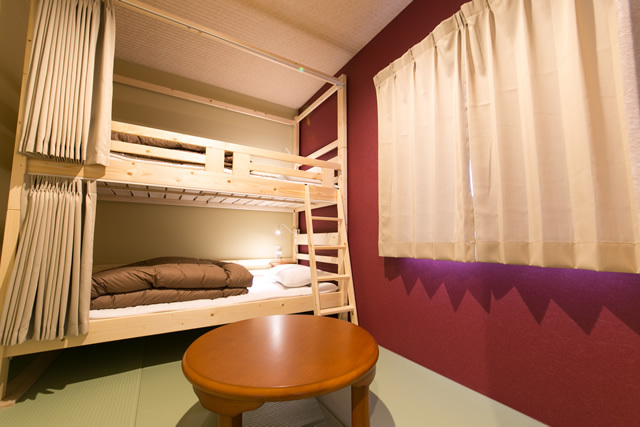 The man and woman common use dormitories are unified with a calm chic color. 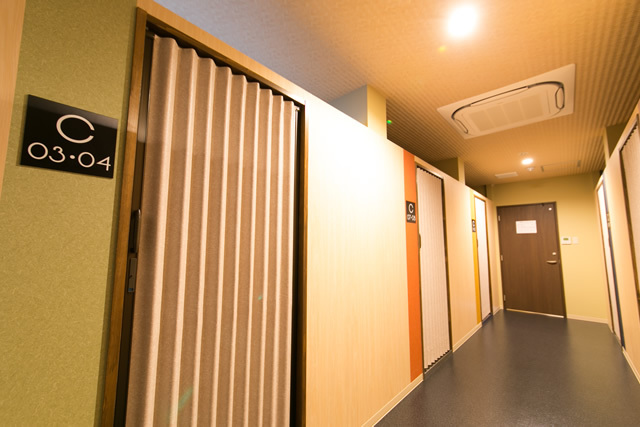 The women-only dormitory has two kinds of gorgeous wall paper. In addition, I provide a reading light and an outlet for the bed. Please use it in carrying and glasses, a book. Private room (six rooms, for each two beds). From Sunday to Friday night: 4,000 yen (tax-excluded) . Saturday, a busy season night: 4,300 yen (tax-excluded). From Sunday to Friday night: 7,000 yen (tax-excluded). Saturday, a busy season night: 7,600 yen (tax-excluded). From Sunday to Friday night: 9,000 yen (tax-excluded). Saturday, a busy season night: 9,900 yen (tax-excluded). The floor can relax slowly in a tatami mat. 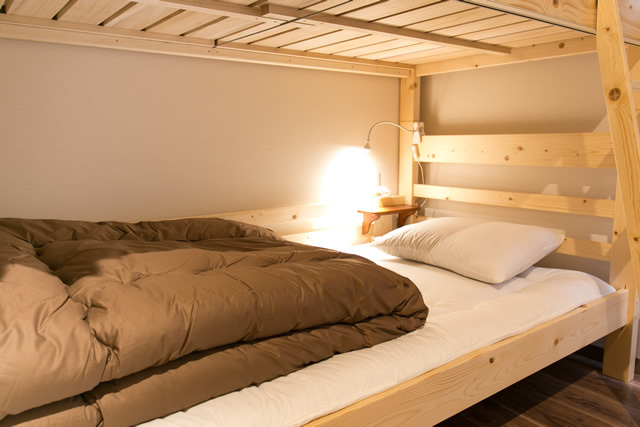 You can store the dining table by folding under the bed. You spread futon on the tatami mat and am available in three people. Equipped with locker with a key. There is a locker with a key in each room. Please manage the valuables by yourself. The small child, elderly, the tourists from the foreign country stay at our hostel. For the comfortable staying of all of you as one of understanding cooperation thanking you in advance. It becomes a principle, the self-service. The entrance of the hostel is locked during from 22:00 to 8:00. During this time, please enter it with an exclusive key. フBusiness hours of the front desks are until from 8:00 to 21:00. For the cleaning in the hall, the use of facilities in the hall is not possible during from 11:00 to 15:00. When the shutter of the front desk closes, please contact us with the intercom of the passage. At the entrance of the hostel, please change into slippers. The meal does not prepare. Please use a restaurant and a supermarket, a convenience store in the neighborhood. You follow rules mutually, and please use the public kitchen. All the halls are smoking cessation. The smoking, please use the exclusive space in the outdoors. When you go out, please do not put valuables in the room.I would like the management of valuables by yourself. About theft, loss, the accident in the hall, we cannot take all responsibility. Thank you for your understanding. There are none at the closing time. However, please consider it as other visitors going to bed do not come to trouble you in the middle of the night when you are back. You keep facilities, facilities and the equipment in mind for the handling, cleanliness, rearranging, order carefully, and please be careful with the act that is a nuisance to other hotel guests. You report it to the staff, and please obey the instructions by any chance when you are damaged or you are lost. We decline the use by the pet companion firmly. We decline that you bring in the thing with a bad smell, the bad smell, ignition such as gunpowder, volatile oil or a flammable thing, a dangerous thing threatening the safety of other visitors firmly. The reservation to our hostel is available. Call time from 8:00 to 21:00. A reservation is possible in the partner site. © 2016 Guest House ROJIURA.